Puppie Love Logo Pup Adult Long Sleeve T-Shirt-Large by Puppie Love at Fdccla. MPN: SPL004-TG2000-IND-LG. Hurry! Limited time offer. Offer valid only while supplies last. Puppie Love Logo Pup Adult Long Sleeve T-shirt. 6.0 oz. 100% preshrunk cotton for ultimate comfort and fit. Soft premium cotton for added comfort. 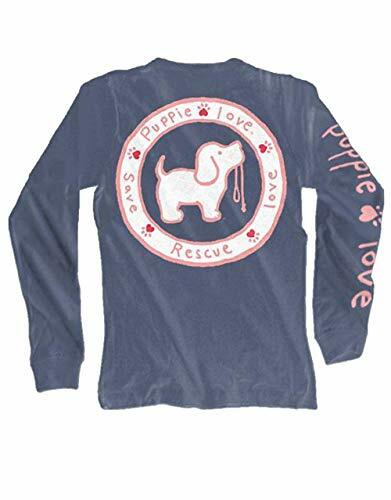 Puppie Love Logo Pup Adult Long Sleeve T-shirt. 6.0 oz. 100% preshrunk cotton for ultimate comfort and fit. Soft premium cotton for added comfort. Classic Cut for a roomier fit. Double needle stitching in bottom hem for extra durability. Seamless double needle collar to lay flat on your neck. Front features Puppie Love logo on the left chest and the back features an adorable and unique Puppie Love graphic print. Makes a perfect gift for holidays, birthdays and other special occasions. If you have any questions about this product by Puppie Love, contact us by completing and submitting the form below. If you are looking for a specif part number, please include it with your message.